Special Homa pujas are performed on Moola star days. Masi Laksha Archana is conducted in February-March. 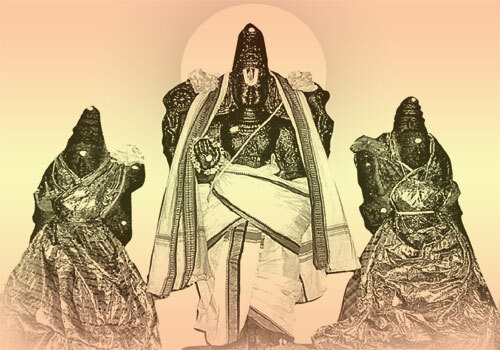 Hanumath Jayanthi in December-January and Aani Tirumanjanam are other festivals in the temple. Sri Anjaneya in the temple appears as a definition to the quality of humility with one had folded and the other (right) covering his mouth. The temple is open from 6.00 a.m. to 10.00 a.m. and from 4.00 p.m. to 8.00 p.m.
Sri Vasudeva Perumal Temple, Kadagambadi, Tiruvarur district. Devotees perform special Tirumanjanam to Sri Anjaneya and circumambulate the shrine 11 times. A chola king built this temple on the banks of Arasalaru, a tributary to Cauvery installing Sri Vasudeva Perumal with His consorts Sridevi and Bhoodevi. 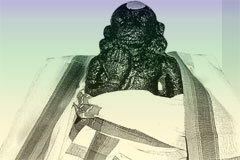 A shrine was built for Sri Bhavya Anjaneya. The temple is in Kadagambadi also known as Sarabojirajapuram. Kadagambadi is 25 km from Kumbakonam on the Poonthottam bus route via Eravancheri. Those travelling from Mayiladuthurai also can reach Kadagambadi, 7 km from Poonthottam. <?xml:namespace prefix = st1 ns = "urn:schemas-microsoft-com:office:smarttags" />Royal Park: +91-4366-251 020-23.